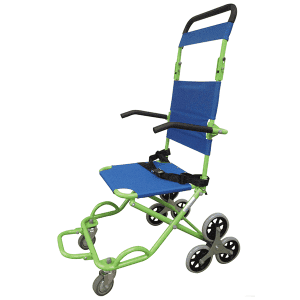 Transit Chairs for transporting patients, used by Ambulance Services. Transit chairs are primarily used to transport persons across level surfaces to a place of safety. A modern version of Patient Transport Chairs used by Hospitals and Ambulance services, they can be used to carry patients up or down the stairs. You do need to consider that it will require physical effort to perform this. It can be used by 2, 3 or 4 people dependant on the person who is being evacuated. Because of the lifting and Manual Handling involved, it is recommended that full Risk Assessment and PEEP should be carried out. Used by Emergency Services around the world and by organisations who want to comply with current legislation, the chairs have a lift capacity of up to 110kg. One area Transit chairs can be found is in basement areas to help support evacuation up stairs to ground level. This is particularly useful if there is no lift that can be used safely in an emergency. Also staircases that may require you to up and down to reach safety may be more suited to this chair. A good Risk Assessment will help you identify all the points you need to consider. 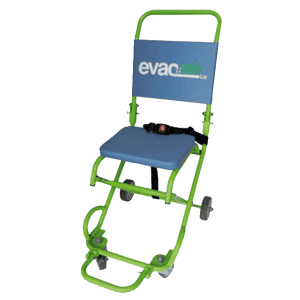 You may want to consider our Tracked Evacuation Chairs which are specially designed with stairway evacuations in mind and can be manoeuvred by just one person. Details of other products and services we offer can be seen on our homepage. The prices displayed online have already been discounted for you. This is our current range of transit chairs, please click the images to get more information on any of the models. These are the best prices available as of 20th April 2019.